Uotila, P.J. 2011. Chenopodiaceae (pro parte majore). Dysphania ambrosioides at Euro+Med Plantbase, the information resource for Euro-Mediterranean plant diversity. Clemants, S.E. & Mosyakin, S.L. 2003. 'eFloras 2008. 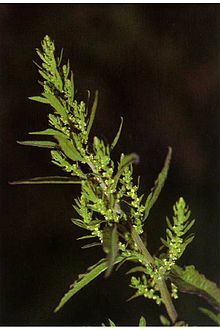 Dysphania ambrosioides in Flora of North America . Missouri Botanical Garden, St. Louis, MO & Harvard University Herbaria, Cambridge, MA. International Plant Names Index. 2016. Dysphania ambrosioides. Published online. Accessed Mar. 20 2016. Hassler, M. 2018. Dysphania ambrosioides. World Plants: Synonymic Checklists of the Vascular Plants of the World (version Mar. 2018). In: Roskov Y., Abucay L., Orrell T., Nicolson D., Bailly N., Kirk P., Bourgoin T., DeWalt R.E., Decock W., De Wever A., Nieukerken E. van, Zarucchi J., Penev L., eds. 2018. Species 2000 & ITIS Catalogue of Life. Published on the internet. Accessed: 2018 Oct. 5. Tropicos.org 2016. Dysphania ambrosioides. Missouri Botanical Garden. Published on the internet. Accessed: 2016 Mar. 20. For more multimedia, look at Dysphania ambrosioides on Wikimedia Commons.